Not too much work, actually, but we did a bit of prep anyway. Until the mains utilties are isolated from the building to be demolished and we have delivery of the HERAS security fencing, and we know when the demolition firm are ready to go, we can but tinker. 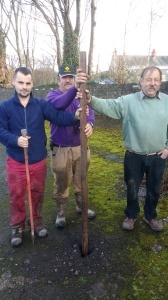 Here Gordon, Gareth and Toby solemnly hold a token first wooden upright pole in place. The poles will hold the security fencing round the building and ensure the cycle path remains safe and open. We have 135 of the poles. The manual digging of the first hole told us that a pneumatic drill will be needed to do the rest. We have one. There is tarmac on top of concrete before we reach soft soil beneath. Anyway. once we had taken a souveinr photo, we removed the pole and filled in the hole again. A Bernard Cribbins song about a hole in the road came immediately to mind. Job done. And undone. But knowledge gained. 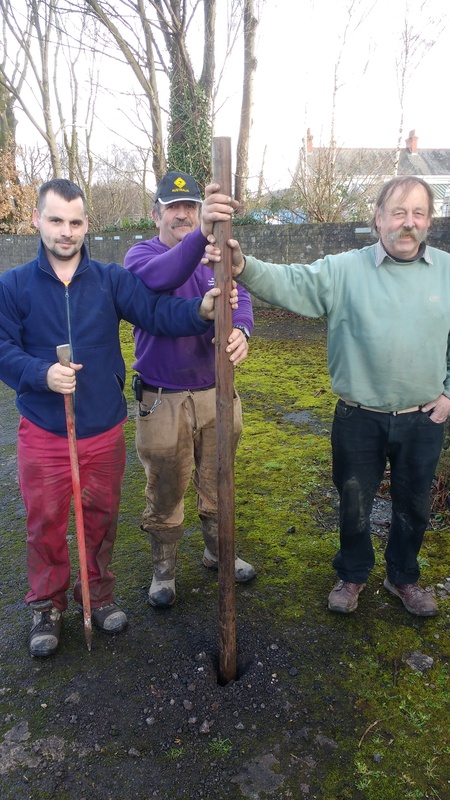 Previous postTHE WEEK AHEAD: 6TH FEBRUARY TO 12TH FEBRUARY 2017 Next postTHE TANK IS OUR WORK HORSE: THE CLYDACH POUND CLEARED, 7.2.17. We would be delighted to have Andrew and/or Ruth join us on the Swansea Canal, be it on the beautiful bits in water or on the bits with ‘potential’. If we ever get the canal back to Swansea Docks we will be both ‘Coast and Country’. Thank you, Stuart. Very kind of you.